The site is situated in Rutherglen, Glasgow and occupies an area of approximately 50m by 50m. Historically the site has been used for various industrial purposes. Groundwater was identified in the made ground layer and was perceived to be either perched or migrating from the site in the direction of the culverted burn. The site investigations identified the presence of hydrocarbon and metal contamination within the made ground and the underlying natural soils. The prime contaminant of concern as determined by Mason Evans Partnership was total petroleum hydrocarbons. The proposed remediation strategy was developed by Mason Evans Partnership and approved by South Lanarkshire Council. The proposed strategy provided the necessary protection for human health and for the water environment. Human health protection would be provided by the provision of buildings and hard-standing / car parking areas across the site which would act as an effective pathway break. The groundwater and off-site receptors would be protected by the remediation of the contaminated soils and associated groundwaters by E-Clay Stabilisation – the objective was to reduce leachabilities of the prime contaminants of concern to acceptable levels. 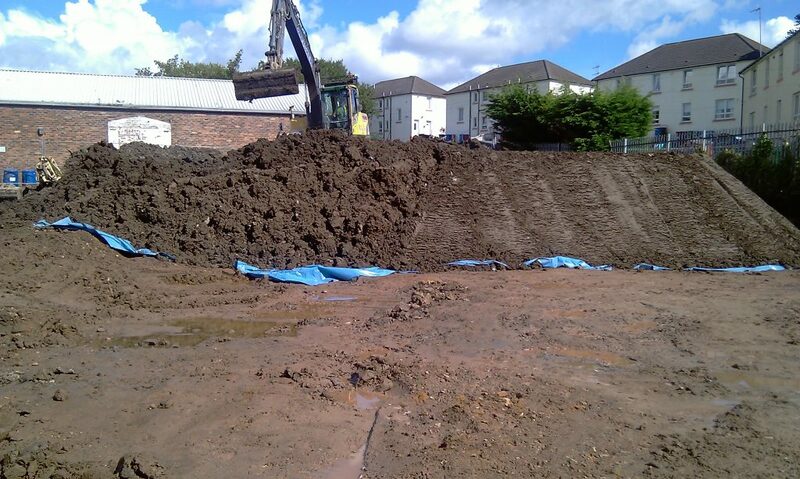 Approximately 2,000m3 of contaminated soils were treated ex-situ. The treated soils were stockpiled pending validation. Validation samples were submitted for leachate analysis to confirm compliance with the agreed Remediation Target Criteria.